Roughly three years ago I started experiencing a bit of ringing in my ears. This is known as tinnitus. I read various articles which all suggested that there wasn’t much I could do about it. There are various thoughts about whether cerumen (aka ear wax) buildup or dental issues may lead to this condition, as well as a host of more serious problems. So, all sorts of possible causes, including simply being related to hearing loss. Given that this ringing carried on, I was motivated to have my hearing tested at a recent company healthcare; there was some loss, especially in the upper end. Finally, it was time to do something about this. I went in for more extensive hearing test with the good folks, mainly in the form of Ronnie McVeigh, at Nutech Hearing which confirmed and refined the preliminary test. While this is a bummer, there is obviously help in dealing with this mainly in the form of hearing aids. The folks at Signia Hearing (formerly Siemens) like to use the tag line: “These aren’t your Mom’s hearing aids” and they’re not kidding but more about that later. This is something I didn’t expect to need, at least not for a number of years. Well, it was time to get vanity out of the way and get over myself, because while I could hear speech reasonably well, it wasn’t as clear as I thought. I was missing some aspects of music and I really want to see if there are some help with the constant ringing in my ears. It turns out that, along with the rest of the world, hearing aids have come a long way. They’re not those huge, honking unsightly things that you used to see on that loud-talking uncle. You don’t need to cringe when you walk into a room with reverberating sound or worry about the squeal as you get next to some electronic device. In fact, you essentially get bionic hearing: that is to say, really spot on hearing of the detail that you may have been missing, in a relatively discrete package. While not invisible, they also don’t bring attention to themselves. Clearly this doesn’t scream “Old dude wearing hearing aids” OK, maybe old dude. 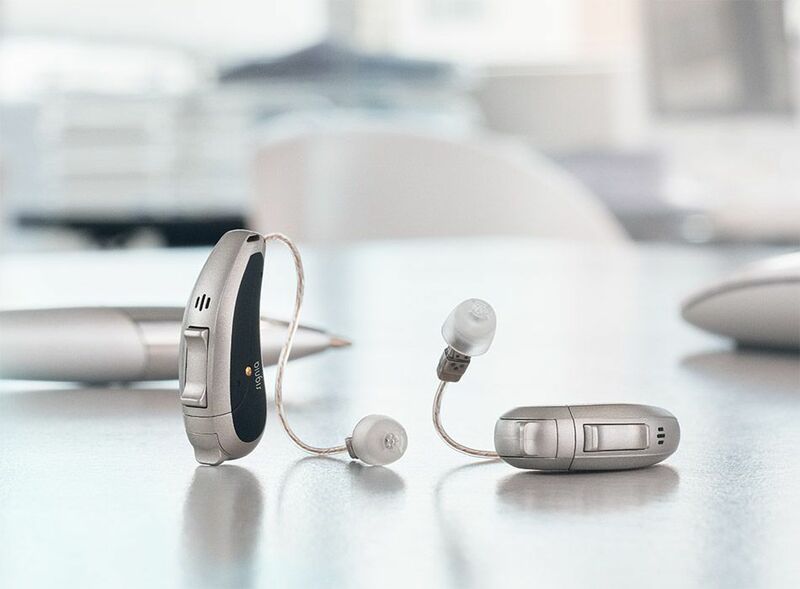 As I said earlier, I could hear conversations relatively well, but wearing the Signia Pure Primax 5’s in a fairly large meeting was a huge wake-up call to how mediocre my hearing really was. All the detail came alive. It’s crisp. It’s clear. We tend to use the phrase “it’s in HD” with everything now. If high definition applies to hearing, it’s in HD with the Signia. It’s not just louder. These things are programmed to accentuate sounds in those areas where there is loss. The higher pitch (and some lower register sound) that would have previously taken louder volume for me to hear something in a particular range, I can now hear at more normal and lower volume. Put another way, these are like having a personalized EQ for the soundtrack of your life. Now there are different situations where you want to do different things. Certain venues are quite loud; I used to use Dubs earplugs (acoustically accurate sound reduction of roughly 12 dB depending on the situation) and still highly recommend this to those without hearing loss. Now I can use an app (available on iOS or Android) to turn the volume down or off. I can also set their spatial recognition to have the hearing aid’s mics point forward or back, about which more later. The bottom line is there’s lots of control over your hearing experience and it will expand your ability to hear well. This is outside of the fact that these aids are constantly processing and learning your sound and adjust accordingly. In fact, the tech in these modern “hearing instruments” is pretty stunning. There’s a lot of processing going on to manage the sound coming around you and highlight what’s important and remove what’s not or is problematic. There is a feature called SpeechMaster that focuses directionality and reduction of noise to highlight what’s important. EchoShield reduces reverberation and eWindScreen™ binaural does an amazing job of mitigating wind noise. It reduces wind sounb by, essentially, recognizing which ear is facing the wind and channels sound through the other ear to the one away from the wind. I’ve used a lot of fairly sophisticated Bluetooth headsets that work on noise cancellation and try to deal with the wind. 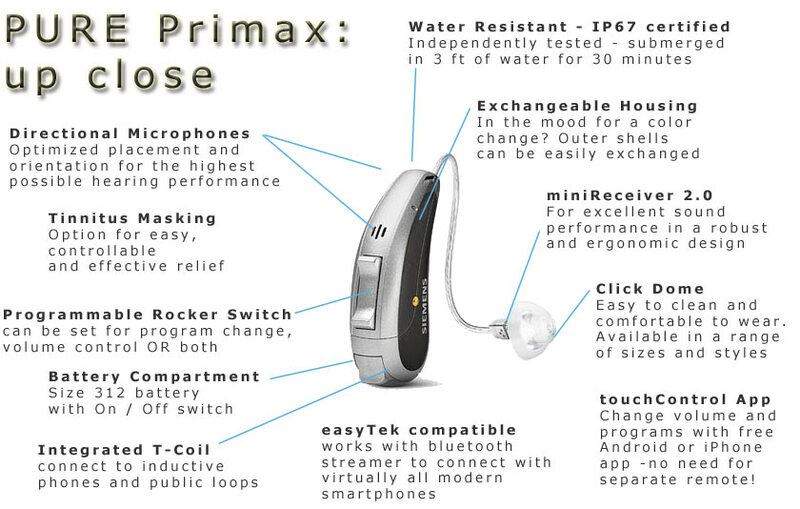 I’ve never used anything that comes close to these hearing aids. Can wind noise come through? Yeah, but it’s got to be a bit of howler hitting both of your ears simultaneously. And that’s simply the core of being able to hear well in day-to-day circumstances. With the app you can select programs that your audiologist adopts for you to have different ways to manage the tinnitus (for example ocean wave sounds as opposed to simple “pink” noise to reduce the effect of the ringing sound) as well as an HD Music program which opens the range for listening to recorded music, live music or as a musician. The two earpieces stay in sync via radio, all of which can be controlled and chosen from your iPhone or Android device. The ones I use have a rechargeable battery where you set them in their recharging unit at night, magic occurs and you’re ready to go the next day. They certainly last all day. If you’re ever in a situation where they run down you can put in non-rechargeable batteries until you have a chance to recharge the others. In other words, this is a thoroughly modern experience that takes your hearing to the next level. For any who have a major loss, (which, thankfully, I do not yet), they provide the ability to understand speech that they may have missed in certain situations. So, for those you that have had no hearing loss, protect your ears. In any fairly loud situation, by which I don’t mean just rock concerts, but possibly at movies, church or football games, wear Dubs (or the equivalent thereof). Now back to that ringing sound – there are various theories, but one suggests when you lose certain sound range, the brain “makes up” for that loss by essentially substituting a “sound” in that same range for what it was expecting. So, in my case, most of my loss is in the upper range and, hence, the “ringing” is there as well. The hope is that with the hearing aids both accentuating that range and providing a masking sound, this tendency will be mitigated. Only time will tell. For those of you who have had hearing loss or think you may have hearing loss, get yourself checked out and see if it’s worthwhile to get some bionic ears. Now, they’re not quite going to make it the $6 million man (though they feel like they come close in cost), they can’t remove tinnitus or regenerate your hearing. However, this serious investment will be worthwhile for many of you. Apparently, most folks live about seven years in denial of hearing loss before they do something about it. Don’t be one of those people. I guess my three is a little better than average but I wish I would’ve addressed it sooner. 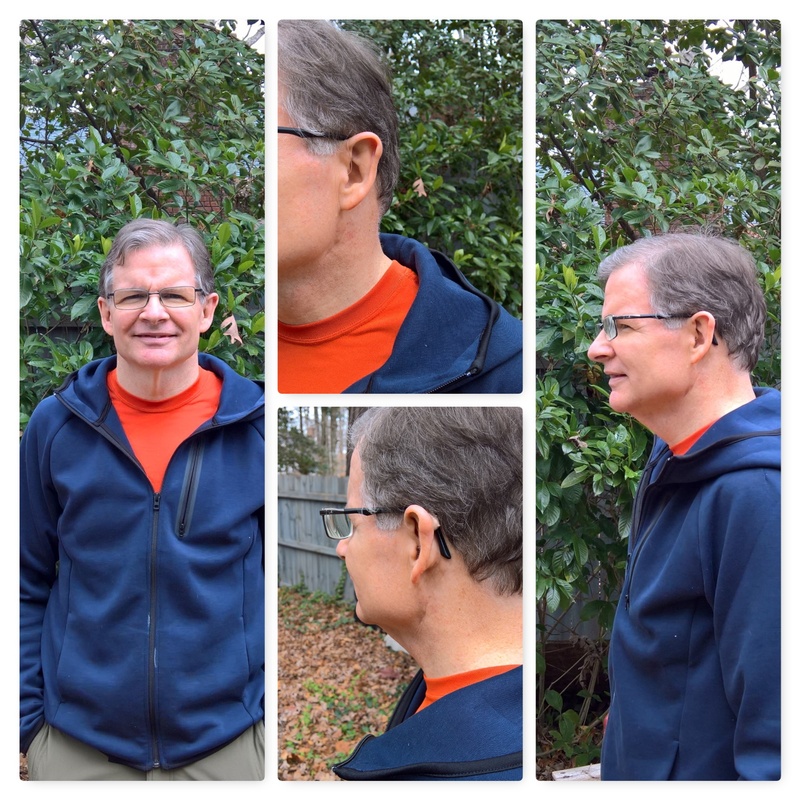 As these get further refinements in programming, “learn” more about my hearing and I get more used to them, I’ll provide updates on the experience. Joe, we would love to talk to you about sharing this wonderful post further! Please contact us as soon as possible. Hi. I’m happy to chat with you. Please DM me on Twitter (I follow @SigniaUSA) to share contact information. Thanks.